There were more small communities along the north shore of the Fraser River. Those early settlements, sometimes less than a handful of homes, were at the river’s shore, a convenient highway for all. However for lumbering and development of the land away from the river, and to attract new settlers to those lands, roads were needed. Incorporation as a municipality would allow taxation for road building and other communal expenditures. It would assure growth and prosperity. With that in mind a group of settlers met at John McIver’s home. The new municipality of Maple Ridge was incorporated on 12 September 1874. It covered the land between the Pitt River and the Stave River, including Pitt Meadows. The residents of this neighbourhood saw no reason to adopt a different name for their neighbourhood. Everyone knew where Maple Ridge was. 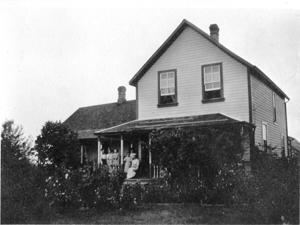 On 3 October 1874 the first council for Maple Ridge was formed at McIver’s farm. The following council meetings were held in a private home but starting in January 1875 the meetings took place in the schoolhouse, on the Fraser below Laity Street. The council meetings continued to be held in that school building, referred to in the council minutes as “Town Hall,” for more than twenty years until in the fall of 1896 the municipality moved their activities to a building in Port Haney. In its early years this neighbourhood between Port Haney and Hammond, had a few more “firsts.” The first school in the new municipality was opened here in 1874 as was the first post office in 1876. In 1882 the first service held at St. John the Devine, in a church building that had just been floated across the Fraser and dragged up the steep shore to the place where it now stood. Maple Ridge’s cemetery was established here in 1878. 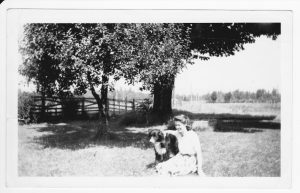 Today only a handful of residents still feel they live in “The Ridge.” In 1930, after the completion of the Lougheed Highway “Haney” became the dominant name for the residential and business area along the new highway between Pitt Meadows and Kanaka Creek. With tenacity residents of the well-defined neighbourhoods of Port Haney and Hammond kept to the old names. Most residents in the old neighbourhood of Maple Ridge, spread over a wider, undefined area, adopted the name “Haney,” if only to put an end to the confusion with the name of the municipality.